Indian batsman Mahendra Singh Dhoni (left) and Hardik Pandya run between the wickets as Australia's Marcus Stonis gestures during their first ODI match in Chennai on September 17, 2017. 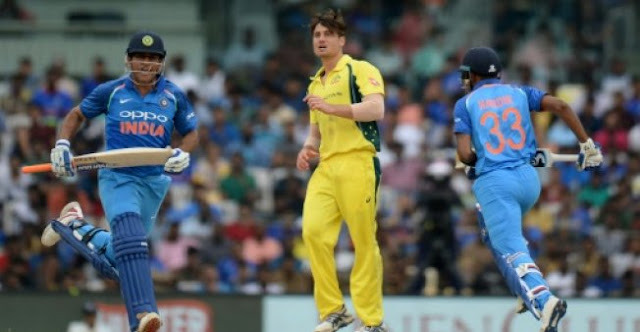 CHENNAI (INDIA) - Fighting half-centuries by Hardik Pandya and Mahendra Singh Dhoni helped India recover from a top-order slump and post 281/7 in the opening one-day international against Australia in Chennai on Sunday. Electing to bat on a cloudy afternoon, the hosts lost five early wickets before Pandya, who hit 83, and Dhoni, who scored 79, shared a 118-run stand to put up a challenging total. Fast bowler Nathan Coulter-Nile rattled the Indian batting with three quick strikes including the prized scalp of skipper Virat Kohli for nought. Kohli tried to slice a widish delivery on the off side by Coulter-Nile but was superbly caught by Glenn Maxwell, who timed his jump to perfection, at backward point. Coulter-Nile, who returned after a string of injuries that kept him out since June 2016, also got opener Ajinkya Rahane, for 5, and Manish Pandey, for 0, to reduce India to 11-3. Rohit Sharma, who made 28, and Kedar Jadhav, who scored 40, tried to rebuild with their 53-run partnership before Marcus Stoinis sent the two batsmen back in the pavilion. Dhoni, who has captained the successful Chennai franchise in the Indian Premier League Twenty20 tournament, then made it count along with Pandya for company. The duo thwarted the Australian bowling with some stubborn batting before Pandya let loose to take the attack to the opposition. Pandya took a special liking to Adam Zampa's leg-spin as he smashed the bowler for a four and three successive sixes in an over to bring up his third ODI fifty. Zampa though did get Pandya out for his only wicket in the innings but the bowlers' 10 overs cost 66 runs for his side. Dhoni soon took over to get some vital runs in the last five overs as he put on 72 runs with number-eight Bhuvneshwar Kumar, who remained unbeaten on 32. The wicketkeeper-batsman, who hit 4 fours and 2 sixes, in his 88-ball stay lost his wicket to James Faulkner in the final over. Fighting half-centuries by Hardik Pandya and Mahendra Singh Dhoni helped India recover from a top-order slump and post 281/7 in the opening one-day international against Australia in Chennai on Sunday.